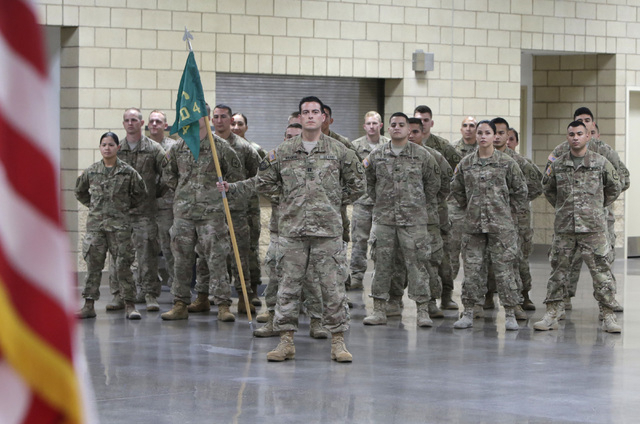 A detachment from the Nevada Army National Guard’s most-deployed unit, the 72nd Military Police Company, has returned, this time from Afghanistan, where it maintained security in a dangerous part of Kabul for U.S. military leaders and its coalition partners. They’re back again, safe at home with their families and friends. “It went as smoothly as possible because nobody came back injured,” overseas commander Capt. 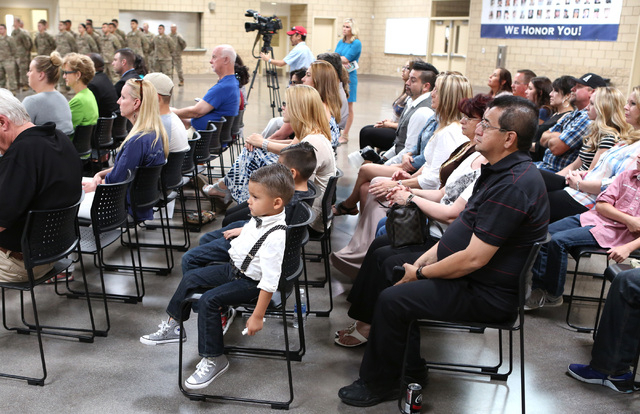 Lorenzo Aranda said before a homecoming ceremony at the North Las Vegas Readiness Center. The unit demobilized in April. “In our case, we were very fortunate. There was an incident on the same roadway but it was a day after we were on it. So, some close calls in that regard, but no direct engagements with the enemy on our part,” said Aranda, 35, who in civilian life is a psychotherapist for a local community counseling center. 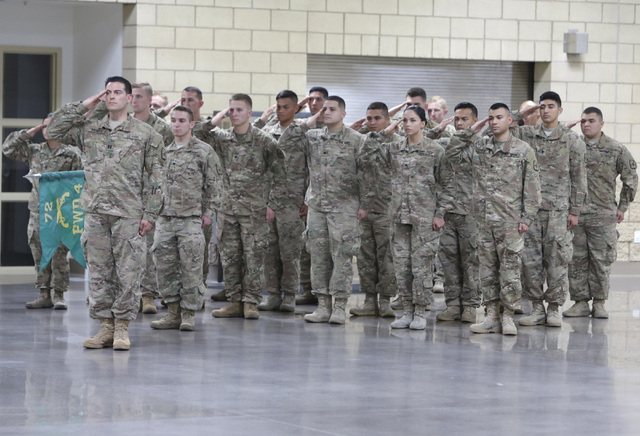 About 30 soldiers from Nevada’s Henderson-based 72nd Military Police Company were welcomed home by Gov. 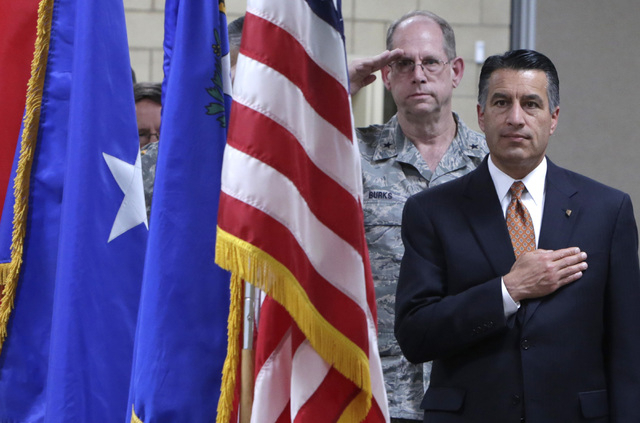 Brian Sandoval after nearly a yearlong deployment in Kabul. They provided security for military leaders at Resolute Support Mission headquarters, a base for 3,500 soldiers from more than 40 coalition countries across from the U.S. Embassy. 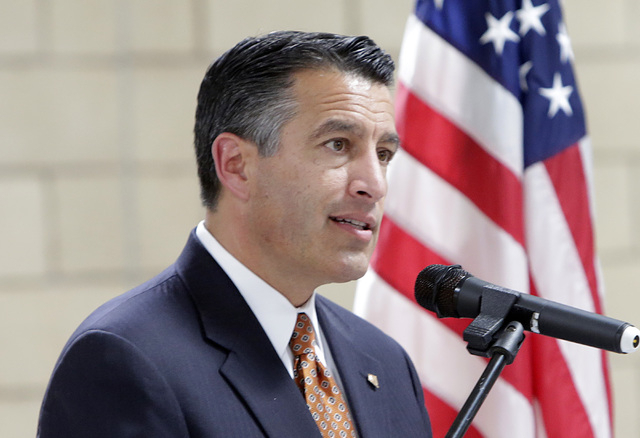 “I hope you’re aware that your bravery inspires a sense of pride and a sense of optimism in the hearts of the masses across our state,” Sandoval said. This was the third deployment for Staff Sgt. Sam Boyd Jr., who served in Iraq from 2007 to 2008 and served in Afghanistan from 2010 to 2011. “We were very busy. We had a lot of high-priority moves. 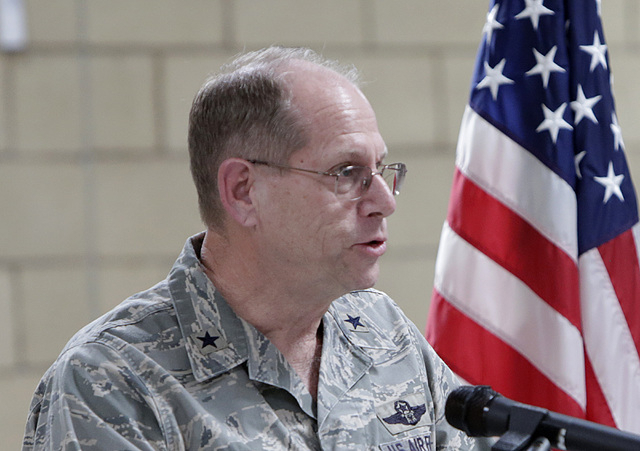 We were running three squads constantly up to nine missions a day,” said Boyd, grandson of casino magnate Bill Boyd, and a 2005 Palo Verde High School graduate. “These are my two kids, my best friends and my only family. 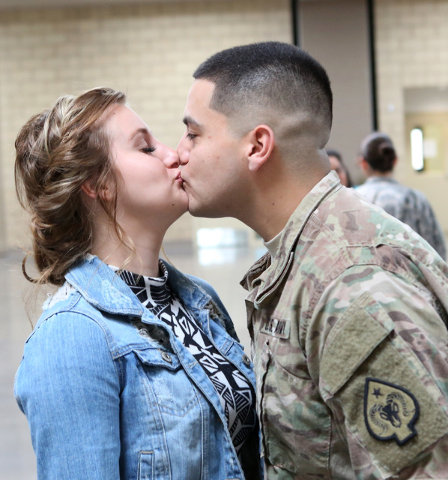 … And I think that serving your country is one of the most prideful things that you can do. And they didn’t quite understand that being so young,” said Cruz, 24, who works as a bartender on the Strip. 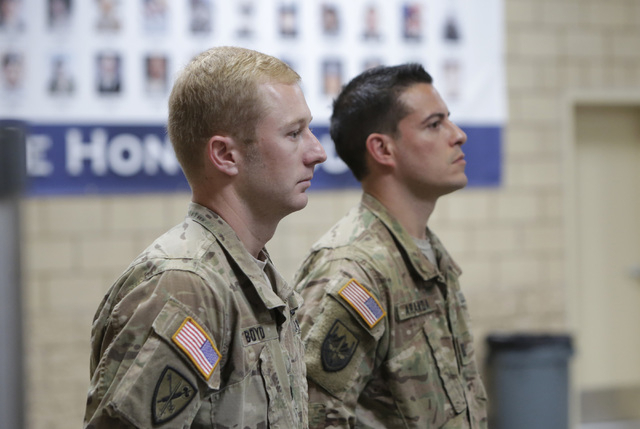 Another 35 soldiers from Nevada’s 137th Military Police Detachment are still in Afghanistan performing law-and-order details including investigations, force protection and customs checkpoint assignments. 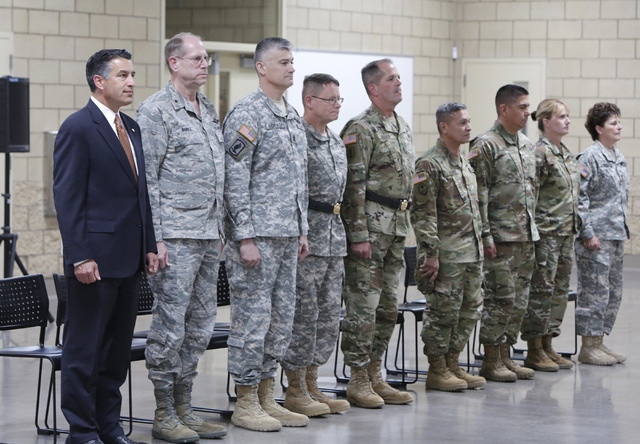 Asked how he feels about Nevada Guard soldiers still in harm’s way, Aranda said, “The utopian idea is you don’t feel truly at rest until everybody is brought back home. This was the fifth deployment for the 72nd MPs since the Sept. 11, 2001, terrorist attacks on New York’s World Trade Center and the Pentagon. Immediately after the 9/11 attacks, they were sent to guard the Defense Language Institute in Monterey, California. Then they deployed twice to Iraq. Between those deployments, they were sent to maintain law and order in 2005 in flood-ravaged New Orleans after Hurricane Katrina. The first deployment, codenamed “Chalk 1,” of this latest, two-phased deployment, was mobilized 13 years after the 9/11 attacks, on Sept. 11, 2014. 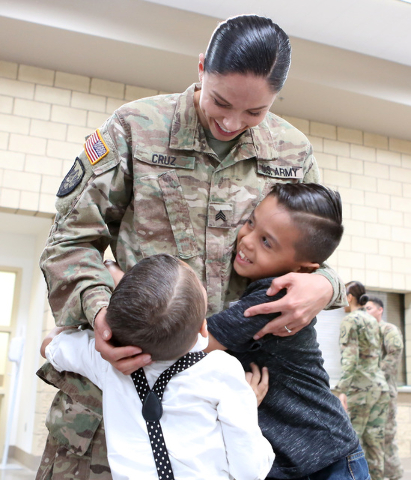 The first group returned nearly a year later after the “Chalk 2” platoon of 30 soldiers had mobilized on May 28, 2015. Contact Keith Rogers at krogers@reviewjournal.com or 702-383-0308. Follow @KeithRogers2 on Twitter. 2001, 2002: Operation Noble Eagle, Monterey, Calif.